Jobber of the Week: The Conquistadors - WrestleCrap - The Very Worst of Pro Wrestling! Note from Blade: Greatest jobber tag-team ever. Stay gold, Pony Boy! 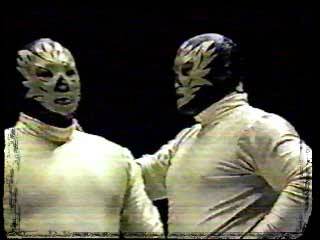 In the history of pro wrestling there has been countless masked tag-team menaces. Generic “assassins,” “executioners,” and “gladiators” have filled the sport for decades. There is one team however that will live on in infamy long after all the masked men have hung up their hoods for good. Yes, this week’s Jobbers Of The Week, the notorious Conquistadors. British Bulldogs. The British Bulldogs of 2004, mind you, which would consist of Dynamite in a wheelchair and Davey smiling down at us from the sky. Rex would leave the WWF after a few months, leaving poor Jose a solo, lonely Shadow. Not wanting to give up the mask, he hooked up with fellow Latin American jobber Jose Estrada and began a golden reign of terror still remembered today. In late 1987, Jose and, um, Jose decided to ditch the bleak black of the Shadows and move on to a more promising color. A color more suited for their dreams of championship gold. Looking like they were wearing the prototype costume for Goldust, the Conquistadors unleashed their assault on WWF tag-teams. Their name in Espanol means “the conquerors.” Sadly, they came nowhere to living up to that name, and 1987 was a rough, bittersweet year for #1 and #2. They would score perhaps their first (and one of their ONLY) victory ever with an upset of the fading Killer Bees. They then would begin their “legendary” feud against Paul Roma and Jim Powers. By 1988, things were still going the same. Losing to Roma and Powers at house shows, and getting squashed on tv. However, things were looking up. Lady luck was shining on #1 (Rivera) as he would receive a shot on national tv against WWF champion Randy “Macho Man” Savage. Even with #2 at ringside for support, things looked bad. Savage would counter by having Hulk Hogan, who stopped #2 from interfering and helped save Savage from the diabolical duo. Sadly, as great as it would have been to see #1 leading the 1980’s WWF as their champion, it just wasn’t meant to be. However, their moment of glory was still yet to be lived. On Thanksgiving night 1988, in Richfield, Ohio, the WWF would hold their annual Survivor Series pay-per-view. One of the highlights would be the 10 tag-team elimination match, featuring perhaps the greatest lineup of teams ever put together at once. You had the Harts, Demolition, the Rockers, the Bulldogs, and Blanchard and Anderson. Oh yeah, you also had the Conquistadors, as well as their longtime nemesises, Roma and Powers, aka the Young Stallions. Hell, the Conquistadors had lost 217 straight matches to the Stallions so it was gonna be a quick night, right? Wrong. The Conquistadors, wrestling like a team possessed, would actually…get this…kick out of pinfalls that evening. Maybe it was the turkey nachos they had earlier, but somehow they made it to the end to face the lone opposing team remaining, the Powers of Pain. To this day, one image still haunts me. The sight of Conquistador #1, jumping around in joy anticipating a countout victory while the Powers of Pain are helping their newfound manager Mr. Fuji, get back on his feet after being assaulted by Demolition. How the referee never managed to count to ten while the Powers and Fuji were outside the ring for almost four minutes baffled and saddened the mark in me for years. There would be no ultimate glory that night. Interference from Fuji would mark the demise for the golden ones in their first and only PPV appearance they would ever have. The Conquistadors would go on losing for a few more years, mostly to…you got it…Roma and Powers. In the end it seemed that the only reason for them existing was to put the pretty boy duo over. By late 1990, Roma had turned heel and formed Power and Glory with Hercules. Perhaps totally shocked and not having a clue what to do in a wrestling world without the team of Roma and Powers, Conquistador #2 Jose Estrada would leave the WWF and his partner behind. Number one would fly solo for a bit, doing jobs by himself until disappearing quietly from the scene in 1991. It would seem that the hole had been buried and the final scoop of dirt had been shoveled onto the grave of the Conquistadors. Tag team wrestling went on without the boys in gold until a dramatic resurrection in the fall of 2000. Edge and Christian, mad that Commissioner Foley had told them they would receive no more title shots against the Hardys, would donn the infamous gold in an attempt to win the belts back. Gone were the days of the workman-like Rivera and Estrada. As Uno and Dos, Los Conquistadors, Edge and Christian would bring the Conquistators antics to a whole new level. Robot dancing, spastic flips around the ring and semi-fake spanish commentary about Taco Bell at ringside would be their trademarks. It ultimately would pay off in a title match against the Hardys at WWF No Mercy in October 2000. With the fighting heart and soul of Rivera and Estrada guiding them, as well as a new legion of rabid Uno and Dos fans, the new Conquistadors would defeat the Hardys and for one night, the men in gold finally brought home the gold. It wouldn’t last long. Edge and Christian planned to then defeat Conquistador imposters “Rick” and “Sparky” (played by Chris Daniels and Aaron Aguilera) to put the belts back on their waist, without the masks. However, the Hardys would depose of Rick and Sparky, put the outfits on, and then defeat Edge in a handicap match. They would unmask and Foley would declare that the Hardys were the new champs. The Hardys trashed the masks, and this new era of “conquest” came to an end. Its now been over 16 years since the birth of the Conquistadors and the legend of mediocrity still looms. Much like Doink, Brother Love, and the Brooklyn Brawler, the outdated silliness of these gimmicks allows for occasional reappearances. In 2003, Rob Conway ad Nick Dinsmore would become the latest model, portraying Conquistador #45 and #47 (according to announcer Tazz, #46 called in sick) and would have a brief run under the hood, ultimately just to be destroyed at the APA’s Bar Brawl at Vengeance on PPV. Ten masked men. One title reign that lasted barely 24 hours. Hundreds of painful losses. The harsh fact that a half-naked Paul Roma has been on top of you more times than your girlfriend ever has been. These are the golden memories that the Conquistadors brought the wrestling world. 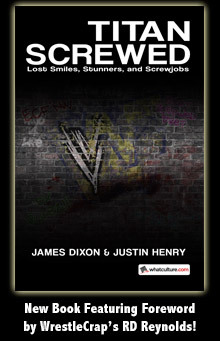 The greatest jobbing tag team ever? In this fan’s book, they will forever be numero uno! 7 Responses to "Jobber of the Week: The Conquistadors"
VIVA LOS CONQUISTADORS! Great work and great wresting history. I think Blade has brought the spirit of the Conquistadors to the web TOO well — their comments section is jobbing to a lotion spam-bot. The fighting heart and soul of Rivera and Estrada are guiding this comment section for sure. I feel the same way every time I watch that Survivor Series. I was just happy for the Conquistodores that they lasted to the finals AND that Powers Of Pain needed interference to dispose of our golden hooded heroes who for one night only seemed to be indestructible, well, almost. Good article, but Los Conquistadors would never be able to top Mulkeymania! Los Conquistadors vs The Mulkey’s…THAT is a licence to print money!